Interior residents got their first detailed look at an ambitious alternative plan to get more natural gas to a region with poor winter air quality and high home heating costs. Representatives from Siemens Government Technologies Inc. made their pitch to the Interior Gas Utility board of directors Aug. 21 by contending they could supply the Fairbanks area with more natural gas without requiring IGU to invest in additional LNG facilities in Southcentral. IGU recently purchased Fairbanks Natural Gas and the Titan LNG plant that supplies it from the Alaska Industrial Development and Export Authority for about $60 million. That purchase, largely enabled by $42 million of Interior Energy Project grant money AIDEA awarded IGU, is part of a larger, $330 million financing package approved by the Legislature in 2013 that also includes plans for a $46 million LNG plant expansion and another $233 million in ultra low-interest loans and bonds to finance gas storage distribution infrastructure in North Pole and Fairbanks. Siemens Energy and Infrastructure Director Kelly Laurel told the IGU board that the company's plan, which she noted was not solicited by the utility, is to partner with the Knik Tribe to get added natural gas to the region by January 2020 on a 20-year turnkey contract. "We're not asking you to make an investment or do any bonding, but just to sign a liquefaction agreement," Laurel said. The Siemens plan hinges on the company's modular "LNGo" liquefaction units that can produce up to 30,000 gallons of LNG per day. The plan is to initially install two LNGo units at a proposed industrial park near Alaska Railroad Corp. tracks in Houston. 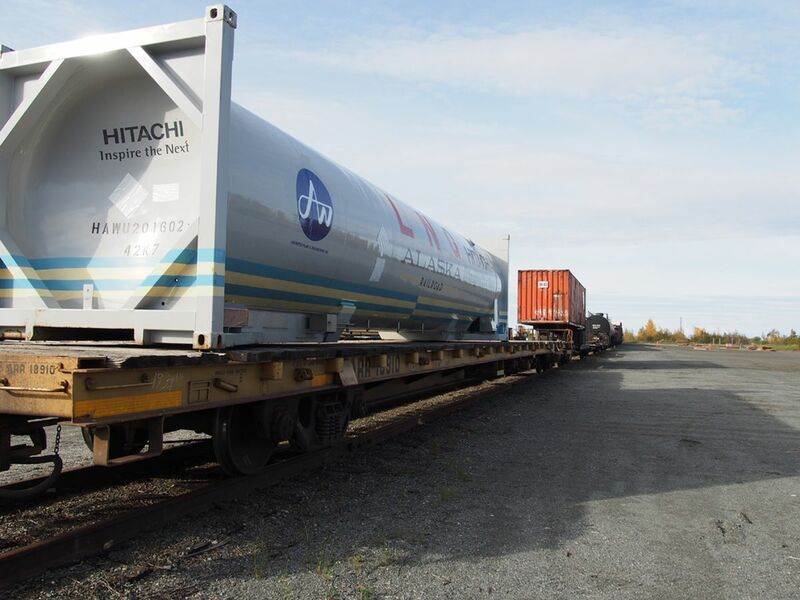 The fuel would travel by rail to Fairbanks Natural Gas' 5.25 million-gallon LNG storage tank currently under construction in south Fairbanks for regasification and distribution to residents and businesses. Once gas demand grew to where more than four of the LNGo units were needed the company would look at installing a single, larger LNG facility, according to Siemens officials. Laurel and other Siemens officials acknowledged— as they did last October when they pitched the idea to the AIDEA board of directors — that the company hopes to parlay involvement in the Interior Energy Project into more gas supply projects in the state. She said the company mostly does work for Department of Defense installations and would like to grow into supplying the Interior military bases and possibly other developments with natural gas. "This particular project to the Interior, we see this as just one step in the infrastructure build out of Alaska," she said. Under the plan, IGU would sign a 20-year liquefaction services agreement, or LSA, with the Knik Tribe but the responsibility for executing the contract would flow to Siemens through a separate contract with the tribe. IGU would also sign a transportation contract with the Alaska Railroad, but that cost would be rolled into the LSA terms. The company is partnering with the Knik Tribe because the federally recognized Tribe has access to federal loan and grant programs that could provide lower-cost financing to the project, according to Siemens officials. It would be located on land owned by Knikatnu Inc., a Native village corporation. Laurel said Siemens believes it can secure a gas supply for far less than the price of $7.72 per thousand cubic feet, or mcf, that IGU agreed to in its three-year contract with Hilcorp Alaska. Siemens is in talks with multiple Cook Inlet gas producers, she said, and believes it can secure feedstock gas for $5 per mcf, which would be significantly cheaper than the gas price Southcentral gas and electric utilities have been able to secure on much larger volume contracts. The Siemens-led group is also investigating the prospect of developing potential gas reserves in the Houston area, which would bring the feedstock price down to $4 per mcf, according to the company's project documents. "We believe we have a firm (gas) supply to be able to contract to rail your LNG to you," Laurel told the IGU board. She said partnering with Siemens and the Tribe on a performance-based contract would shift LNG supply and operational risks from the utility to the company. "You won't get these sort of 'whoops' bills or overrun bills. That's our problem to deal with," she said. On cost, Siemens believes it can deliver LNG to FNG's storage tank for $15.02 per mcf, based on a $5 per mcf gas feedstock price. Members of the IGU board had questions for the Siemens representatives but largely withheld judgment on the proposal. New IGU board member and Fairbanks-area resident Gary Wilken, who recently resigned from the AIDEA board to take the local position, noted that even with $5 feedstock gas, another $5 per mcf would need to be added to the final customer price to cover regasification and distribution costs, bringing the "burner tip" cost into the $20 per mcf range. AIDEA and FNG have estimated their plan, with its state financing support, would result in an initial $17.30 per mcf burner tip price to consumers in 2020. That price could drop to the $15 per mcf IEP goal by 2022 more customers are brought online. Using IGU's contract price, Siemens would get LNG to the Fairbanks storage tank for $17.98 per mcf, according to the company — plus $5 to get it all the way to customers. Siemens representatives said they can have the operation up and running 12 months after contracts are signed, which would mean IGU would have to agree to the plan by the end of the year to get gas flowing by January 2020. Laurel acknowledged there is a lot to negotiate. "We recognize that this is a great opportunity to advance Alaska and its infrastructure," she said.